Since the Milwaukee Board of School Directors gave MPS superintendent Dr. Gregory Thornton an extra month to work out a relocation site for the early childhood education program at 68th Street School, which the board voted in December to close at the end of this school year, community activists have been busy working on a plan of their own. 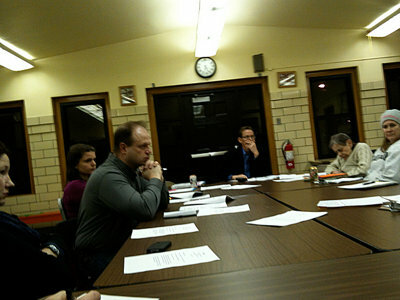 However, after a number of meetings, preparing a 47-page proposal to merge 68th Street’s program into nearby 81st Street School, going door to door in three neighborhoods that surround the two schools, the community members are concerned that the plan isn’t even being considered by MPS administration, which now has a pitch to make, too. The district proposal is on the agenda of next week’s full board meeting and it seems likely the community proposal will come up in that discussion. The ball is now firmly in the board’s court. But frustration has apparently been bubbling to the surface over recent weeks as community members and 68th Street School staffers have felt that they are not being taken seriously by district officials. At a public meeting on Tuesday night at the Enderis Park Fieldhouse, attended by school board directors Jeff Spence, Meagan Holman and Dave Voeltner &ndash; as well as Ald. Jim Bohl &ndash; organizers said they feel that MPS regional executive specialist Keith Posley &ndash; who oversees the region that includes both schools and who is meant to be the community’s access point to Dr. Thornton &ndash; has been shutting them out. On Thursday morning, Posley visited 68th Street School to meet with staffers and community organizers and informed them the administration would move forward with a plan to permanently move the 68th Street School program to Kluge School, four miles to the north. Posley also told them that any plan for turning 81st Street School into a neighborhood school (as the community proposal suggests) would be considered separately, echoing a statement by Spence at Tuesday’s meeting that the plans for the two schools are viewed by MPS as unrelated discussions. “We just received the proposal this morning,” said MPS spokesman Tony Tagliavia in an email Thursday evening. Wednesday was the deadline for getting an item on the agenda for next week’s meeting. “We’re always happy to hear from families and their thoughts about the future of Milwaukee Public Schools. We certainly will review the plan. The new plan was presented to us (Thursday) morning. The Kluge plan was put into the process for board consideration (on Wednesday). Tagliavia said that the administration’s Kluge proposal emerged from “extensive review by administration and consideration of no fewer than eight alternative scenarios.” He did not elaborate on the nature of those scenarios nor whether or not a merger with 81st Street School was among them. One of the sticky issues in the proposed merger is that it includes moving three grade levels &ndash; sixth, seventh and eighth grade &ndash; out of 81st Street School to create capacity for the incoming 68th Street School program. The plan would transform a K-8 school into a K3-5 program. The district currently receives no state funding for K3 students. Bohl, who represents the Cooper Park and Kops Park neighborhoods, and Ald. Michael Murphy, whose district includes Enderis Park and Lenox Heights, have written letters of support that form part the community proposal that was created with the assistance and support of the neighborhood associations in Lenox Heights, Enderis East, Enderis Park and Cooper Park. At Tuesday’s meeting, Bohl echoed the community proposal’s assertions that these neighborhoods are home to many families with young children and that most do not enroll in 81st Street School. Although 81st Street School, a mile west of 68th Street’s current building, is considered a neighborhood school under the 2000 MPS Neighborhood Schools initiative, Witt said at Tuesday’s meeting that only around 60 neighborhood kids attend the school, which has an enrollment of about 310 students. It was noted at that meeting that more kids in the area choose Wauwatosa and Elmbrook public schools via open enrollment than choose 81st Street School. There are also a number of private, religious schools in the neighborhoods. Bohl believes MPS is missing the boat in neighborhoods such as these where parents are saying &ndash; in this case via more than 350 signatures on a petition supporting the merger proposal &ndash; that they want to attend MPS, but don’t feel there is a successful enough program there to make it a viable choice. Witt confirmed that MPS administration did, in fact, receive the final proposal on Thursday, but said she believed the district was aware of the proposal throughout the process. She said that four school board members, plus aldermen and others have attended the public meetings on the proposal. Other board members were contacted and kept apprised of the developments, too. “Administration has known the entire time what we were working on, but no one asked to assist us or to work with our community. Jeff Spence said on Tuesday it was because Mr. Posely and Dr. Thornton assumed that it was only the 68th Street teachers putting all of this together, and that Mr. Posely hadn’t realized that this had turned into much wider community effort. The neighborhood groups and 68th Street School community will move ahead with their proposal, which they are presenting to all board members in advance of next week’s meeting. The organizers met with the staff at 81st Street School on Thursday to seek its engagement in the process. But the board could render that plan moot if it votes to accept the administration’s proposal to move the 68th Street program to Kluge at its January meeting. It remains unclear how such a vote will turn out. “The administration’s recommendation is based on what the Milwaukee Board of School Directors told them to do,” Spence said in an email on Friday.